HomeLifestylePizza or pasta? Which is the healthier one? 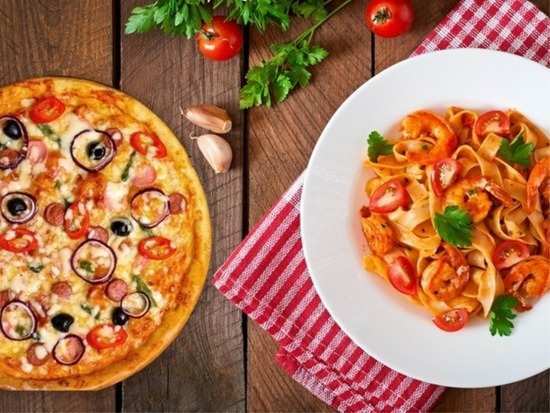 You can choose between a pizza or pasta when you compare their nutritional value, portion sizes or the type of pizza or pasta. Let’s be real, with cheese as the hero ingredient in the Italian cuisine, both pizza and pasta are not the ‘healthy meal’ you’re looking for when you’ve stepped out for a meal. While the refined flour pizza base is topped with oodles of cheese and only a few healthy ingredients to boast, pasta also consists of cheese, refined flour and a negligible amount of healthy ingredients. Then how do you decide which one is healthier? The key is in how both of these dishes are made. Here are the principal aspects to keep in mind while you order that ‘healthy’ meal of pizza or pasta. Cut down the carbs contents of a pizza by opting for a thin crush. Ensure it is topped with veggies and lean proteins. Avoid pepperoni, they’re high in fats. When it comes to nutrition in pasta, it depends on how it is cooked, and how many veggies are being added to it to determine how healthy will it be. The portion size of a meal makes a huge difference. On average, 4 slices of pizza equals the same amount of calories to a bowl of spaghetti. So do the math, and make your pick. Here's hoping, the next time you're out, you make the healthier choice! 1Pizza or pasta? Which is the healthier one? 7Can scientists replace batteries in pacemakers with the heart's mechanical energy? 8Men don’t open up about their mental health. Why? 9What is the dopamine diet? Find out if it works!